The party that she plans to attend on Friday (and mentioned on the 22nd)—apparently didn’t merit a second mention when she wrote this entry. What did Grandma do on quiet winter days? Did she ever bake or make candies using Karo corn syrup? Correction: After I published this post, I discovered that I’d made an error–and that Karo does not contain high fructose corn syrup. According to a FAQ sheet on the Karo website, Karo is made of regular corn syrup (glucose only). See comments below for more details. Posted on February 24, 2014 February 24, 2014 by SherylPosted in AdvertisementsTagged family history, genealogy. Oh Grandma….Ditto…really?? Sheryl I agree what was she doing with herself these days? Maybe it was difficult for her to synthesize her thoughts enough to write them in the diary. I have some Karo in my cupboard. I just looked at the ingredient list. No mention of high fructose – just Corn Syrup and real vanilla. I have the lite version. Thank you for checking on this. You are absolutely right–Karo does not contain high fructose corn syrup. After I read your comment, I found the Karo website and added a correction to the end of my post. Thank you! No, Karo is not the super-evil high fructose. Use it with abandon! I may not use it with abandon, but you’re correct–it does not contain high fructose corn syrup. I made an incorrect assumption–and definitely should have done more research when writing this post. I added a correction at the end of the post. Thank you! We used to have Karo at our house when I was growing up. We also used Karo when I was a kid. We put it on pancakes and waffles–though I preferred Log Cabin or Aunt Jemima’s over Karo. 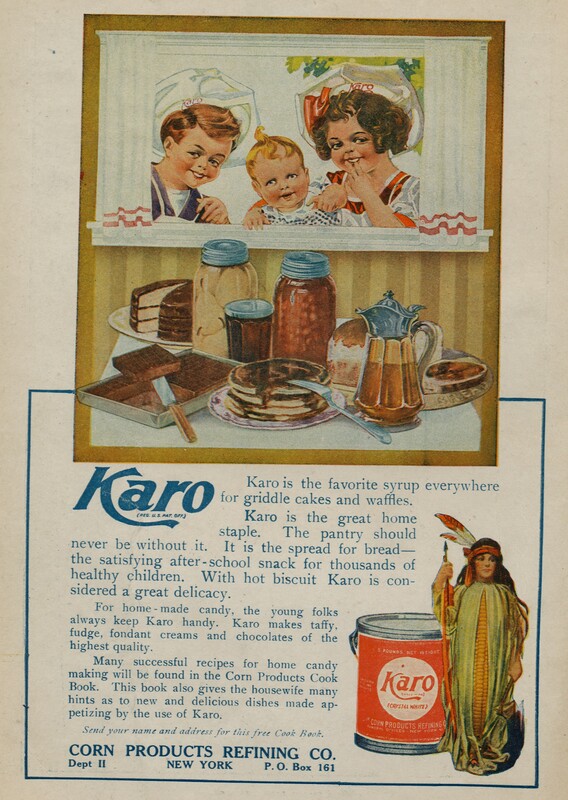 I wonder what the history is behind the Karo Syrup corn queen in the ad. It would be interesting to know more about the corn queen. She looks Native American. I think that there was a lot of fascination with (as well as sometimes negative stereotyping of) Native American culture a hundred years ago. Check this out. She is on the certificate. Interesting. . . thanks for the links. It’s mostly about the quantities… Today high-fructose syrup is found in almost all the ready-made foods, and the result it that people consume way more than they ever did in those days. I agree–It is so important to eat a variety of foods. IF Grandma only knew how frustrating “Ditto” would be to all of us 100 years hence, would she have dittoed, probably! Day in and day out you produce a high quality blog. You make the work it takes seem like no effort at all. I may not always comment but your blog is one I look forward to each day. Thank your for the kinds words. I have a lot of fun doing this blog–and it’s wonderful to hear when someone appreciates it. Oh dear, I remember Karo syrup. Hmm ….. When I was a kid, we always had a bottle of Karo in the kitchen. Sugary treats were also way less frequent than modern times! Too much processed stuff today! Ditto? She really isn’t sharing all that’s going on her head, is she? Maybe she’s afraid Ruth (or someone else) will read it. I also sometimes get the sense that she worried that someone else (Ruth?, her mother?) might be reading the diary. I would find it very interesting reading to know what she did in the every day of her life. So would I. . .though unfortunately the diary ends in December, 1914 so we’re left guessing about a lot of things.